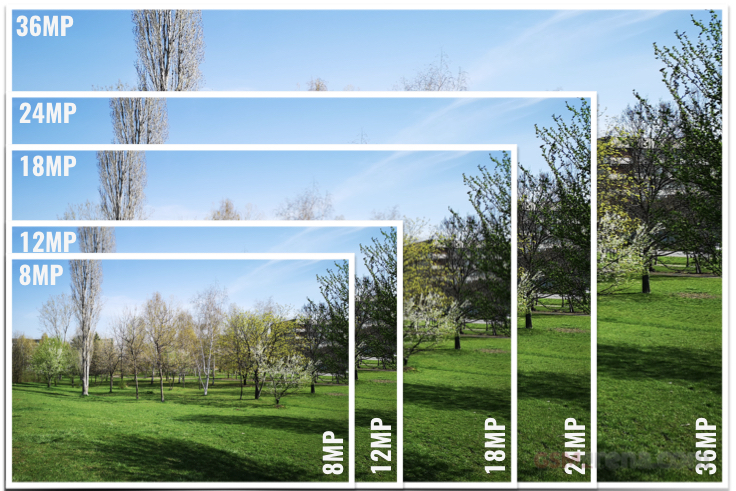 Today’s smartphones come equipped with a very comprehensive set of camera related specifications. Our smartphone, for many of us, has become our primary camera due to it being the one we always have with us. In its purest form, smartphone photography is all about collecting photons (light) and converting them into electrons (image). The capabilities of the supporting hardware and software are paramount to producing high-quality images of your chosen subject. An equally important part of the smartphone camera experience is the Image Signal Processor (ISP), this is part of the silicon within a smartphones chip-set/CPU and in conjunction with the phone's software and OS provides additional enhancements and special effects when both capturing images and to the pictures once captured. These include face detection, filters, panoramic scene capturing and object identification. Images are also geo-tagged with the GPS coordinates of where the image was captured if the phone has an internal GPS chipset. As a comparison, when playing back images on a television or monitor - a 4K TV has an 8.3-megapixel count while an HD TV has a 2.1-megapixel number. In most cases still images are stored either as jpeg or HEVC, these compress the image file size without losing any detail (loss-less compression). Some high-end phones capture in RAW leading to much larger file sizes. The most common format for recording video is H.264/H.265. Google and Apple provide paid ‘cloud’ storage for off-loading your photo’s and video’s over WiFi or cellular to reduce the impact on the phones internal storage. The Aperture of a lens indicates how much light the lens lets in. The larger the aperture, the more light is let in, conversely a smaller aperture lets in less light. Measured in f-stops, these are inverse values, as shown in the aperture chart above, the larger the aperture the lower the f-stop number. An aperture of f/1.4 lets in more light than an aperture of f/8. Helps eliminate camera shake and produce a better quality image. Some phones successfully use Digital OIS, but the best phones use a mechanical Optical Image Stabilization system. Modern smartphones have an internal autofocus system, you can’t see this as the external Lens Covers is fixed in place. Only autofocus cameras can allow shooting of really close objects - i.e., macro shooting. Many smartphones, when zooming in on your subject, use a digital zoom which produces a lower quality image at any given size as it’s effectively ‘cropping’ in for you. However, many flagship smartphones are using a 2nd lens to provide Optical Zoom. PDAF Technology uses paired masked pixels on the image sensor, designed to mimic your eyes. The ISP adjusts the camera lenses until both images are synchronized with each other and the subject deemed to be in focus. PDAF is faster to focus that Contrast Detection Auto Focus (CDAF) and gives a sharper photo. The camera system is outfitted with a laser transmitter and receiver. The phone uses the time taken for the laser to bounce off its subject to determine the distance to the target. Good for taking photos quickly and in low light but less useful for landscape photos where the subject is far away from the camera. A flash will brighten your subject when lighting conditions are poor. LED flash technology was until recently the most common flash for smartphones. It’s low power, takes up little physical space and can be used continuously. However, it only illuminates a very small area, it’s slow (resulting in blurred fast moving objects), and the color temperature is often ill-suited for a given scene. For example, an LED flash gives off light roughly at a temperature of 5,500 Kelvin (K) which equates to the temperature of Sunlight. This is why some photos may appear blue when shooting indoors in low light with an LED flash. To provide a light temperature that better matches the environment some smartphones include multiple LED’s in a flash itself. Each LED produces a different temperature of light, and when combined can create a more natural looking image. HDR or High Dynamic Range attempts to add more "dynamic range" to your photographs. As opposed to taking one photo, HDR mode takes three photos at different exposures. The CPU/ISP combine these three images together and highlight the best parts of each photo. Often your smartphone can give you the regular photo and the HDR photo. The result should better mirror what you see rather than what your smartphone lens sees. Check out the comparison shots below to see the starked difference when looking at shadows for example. Dependent on your subject matter and lighting conditions HDR isn't always the best solution. As such, smartphone manufactures employ AI and Auto HDR to determine the best possible use of HDR and other modes. A number of steps happen behind the scenes in order for your smartphone to capture a panoramic picture. Firstly, your camera app takes a series of overlapping frames as you pan your phone across the scene or landscape. The individual frames are then 'stitched' together by your CPU/ISP to form the finished Panoramic. Clearly, it's not as simple as described. The CPU/ISP works in conjunction with your smartphone's camera AI, gyros, and other features to not only to position each frame within the overall panoramic but also to ensure each frame matches its neighbor's exposure, color and so on. All this remarkable trickery ensures the highest quality overall image possible. The majority of smartphones are capable of capturing 720p HD video 30 frames per second (FPS) as a minimum. The higher the FPS the smoother the video or in the case of slow-motion shooting, the slower you can make a video without losing quality. The higher the resolution and the higher the number of frames the more storage space is required. For the higher 960fps smartphones, we recommend checking the manufacturer's smartphone specs to see exactly how the 960 fps works. Some phones, capture a very short burst at 960 fps - making capture trickier. Main Camera - refers to the rear-facing camera system. The lens or lenses reside on the rear of the phone or within a backward facing pop-up camera module. Selfie Camera - refers to the front-facing camera system. The lens or lenses reside on the front of the phone or within a forward facing pop-up camera housing. Additional hardware and software can be combined with the selfie cam to provide sophisticated face recognition capabilities. The Selfie Camera is also used for video conferencing applications. Depth sensing capable camera systems can be utilized for Augmented Reality applications and animated emojis. The total number of lenses contained within the Main and Selfie camera systems. Referred to as Single, Dual or Triple. We detail each camera lens on a separate row for clarity. Specs include the number of megapixels, aperture, focal length, sensor size, zoom type and methods of stabilization and focusing system. In multi-lens smartphone implementations manufactures choose different lens combinations that they deem suitable for providing the best and most versatile solution. For example, a combination of wide-angle and zoom lenses.